When I Blogged to you about having problems with my Olympian Catalytic Heater, I was camping at 7,529 feet elevation. Last nite our Nite Camp was at 6,479 feet elevation. Only 1,040 feet lower. But that made a big difference for the heater's operation. I was comfortable all nite long! Initially, we were going to use US 395 on this trip to Riggins Idaho and the Main Salmon River. However, we've been cautioned about a slide on US 395 near the Nevada border. Instead, we are thinking about turning west when we reach State 89 then go up the east side of Lake Tahoe. We may encounter some slow traffic when we reach Topaz. It's not clear exactly how things are near Topaz. The Scampy Team has arrived in the City of Gardnerville Nevada. When we passed thru the area of the US 395 slide, the signs of a few slides could be seen. But now, everything is cleaned up. When we came to State 89 which headed west, that way did not look good to us. Too high an elevation over the pass. We stayed on US 395. 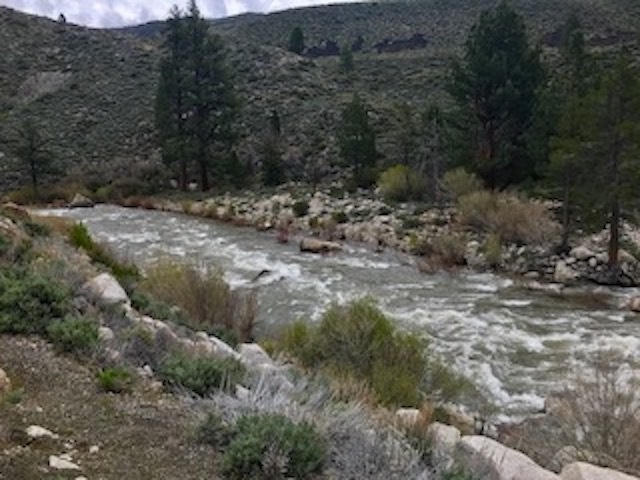 Below is the West Walker River. The West Walker has a pretty high gradient here. I believe that it's pretty close to the headwater. A little way downstream, the river picks up a lot of volume. 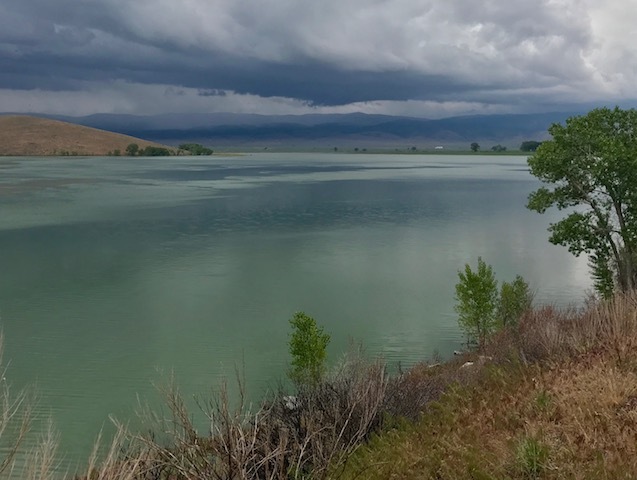 What color does Topaz Lake look to you? We were just driving around in the outskirts of Gardnerville Nevada and attempted to make a U-turn to return from whence we came. And guess what happened? Señor Tránsito got stuck in the wet mud alongside the road! Wow! Just about then, a fellow who lives in that neighborhood pulled up and asked, "Do you need a tow to get out of that mud?" Of course, I answered, "Yes I do." He used a tow strap to connect to Tránsito's front axle. Even this guy with his 4x4 truck had a problem towing Tránsito out of that mud because of his rear tires being in that mud too [He was not using his 4x4 drive]. Señor Tránsito has to be very careful when he goes off of paved roads. His front wheel drive slips so very easy! Highway 89 appears to be in higher elevation...will transito make it? They probably have detour signs on highway as you get near area of slide. You can also google traffic conditions. We usually check for construction, road condition, and delays before we head out while on a road trip. When I actually arrived at State 89, I did not like the look of the road. It appeared to be very narrow and went up to a pass in the neighborhood of 8,000 feet elevation. I decided against using State 89 and proceeded north on US 395. I also check for traffic conditions. But today I was unable to obtain an easy to understand report on those conditions. If you are trying to avoid elevation, going up to Tahoe is not the right solution. Isn't there a way to head into Nevada? Lake Tahoe is at an elevation of about 6,000 feet. Our heater operates OK at that elevation. I'm now considering taking US 395 north thru Reno Nevada. Then continuing on US 395 all the way to Riggins Idaho and the Main Salmon River. 395 is reopened. Stick to your original plan. Don't forget it is Memorial Day weekend. You do NOT want to be at Tahoe, trust me. Sorry about the three messages. Road blockages are not a problem when you have an RV. You just pull over, put on the kettle and relax. A few hours or even overnight, it does not matter because we have our hotel room with us! George. Love that you are back to your old ways. I have stuck with you and your blog these last few years hoping to see this side of you again. Your blog is being reborn. Keep the pictures coming. Your comment is a huge compliment to me! I totally agree with Croft..put on the kettle is right...besides you said you were in no hurry. You have all the time in the world before winter hits in Rollins. Smell the roses. It seems that you, Croft and myself are Birds of a Feather!" I'm a little bit surprised to hear how easily your front wheel drive Tránsito gets stuck. You might consider going to a more aggressive mud/snow tire. Cons: they might be more noisy, your gas mileage may go down a little. I on the other hand, am not surprised how easily Tránsito gets stuck. When I purchased Tránsito, I gave no consideration to how a front wheel drive tow vehicle would perform. My mistake was buying a front wheel drive vehicle to use towing Scampy. Tránsito has other features that I like. I have room in Tránsito's rear to carry all of my hand tools and supplies [screws, hammers, wrenches, etc]. If I had all of this RV buying to do over again knowing what I know now, I would never have bought Twayler, Scampy or Tránsito. Instead, I would have a nice 4-wheel drive pickup and a cool camper.